" To promote Health & prevent Dis-ease by supporting the body's natural healing powers." Take advantage of the body's own healing powers, by stimulating its inherent qualities. "Affordable & Natural" Family Healthcare. 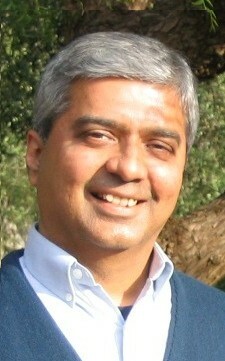 Dr.Rajesh Vyas is licenced as a Naturopathic Doctor by the California Naturopathic Board in Sacramento. His practice is in the SF Bay Area of California, south of San Jose. He graduated from the National College of Naturopathic Medicine in Portland, Oregon in 1991. Before that, he was already a practicing physician after graduating in Homeopathy in 1986. His wife is an MD in Internal Medicine who is employed as a Primary Care Physician. The treatment is individualized to fit the unique nature of the patient, and the circumstances surrounding the state of health. Therefore, different people having the same kind of symptoms can be given different medicines. We are treating the person at large, and not just covering up the symptoms. Initial-Consultations can typically last about 2 hours on average the first time. Cost : Adults :$145; kids :$95 . Follow-Ups are typically 20-30 minutes. Cost :$45 /$35 . These are scheduled 4-6 weeks apart. The extensive history intake includes questions about all aspects of the individuals life, and not just restricted to the area of the symptoms. Past history, Family history, Genetic history, etc. are all part of the information considered in selecting the remedy(ies). The case needs to be studied after the first interview, so the medicines are not given on the same day, but mailed to the patient. Detailed instructions are provided with the medicines. You do not need to wait until the follow-up if you have any questions, and are welcome to call anytime. "Vis Medicatrix Naturae" = Nature is the best medicine. "Primum Non Nocere" = First do no harm. "Treat The Person, Not the Problem"
True Healing takes longer than a mere suppression of the symptoms. "Tolle Causam" = Find the actual cause of the problem. Based on the principle "Similia Similibus Curanter" which means "Like Cures Like"
The body's symptoms represent the best efforts to heal disease. This is a very effective system of medicine with lots of famous people believing in it's efficacy, including Einstein, Gandhi, British Royal Family, Jane Seymour, Kelly LeBrock, to name a few. There are about 3000 medicines to choose from. The "Constitutional Medicine" chosen supports the body's own healing powers in doing it's inherent job of preserving health and removing disease. They are available in all forms including tinctures, teas, and powders. Different herbs have different effects on different people. Interactions, combinations, dosages, and contraindications need to be considered when choosing herbs. Most people take the supplements they do because someone recommended them, or they saw some information in the media. You could be taking the right supplements but in the wrong quanity, or the wrong ratio in relation to another supplement. Hair analysis, and labwork are some of the methods that can be used to determine the patients baseline levels before recommending supplements. The ancient science of Indian Herbal Medicine, popularized by Deepak Chopra, MD, and others. Divides people into three broad body-types, and suggests appropriate foods, lifestyles, etc..
Acupuncture, Hydrotherapy, Massage, Physiotherapy, and bodywork are some of the other therapies taught at the Naturopathic Colleges. Member of American Association of Naturopathic Physicians ( AANP ) and California Association of Naturopathic Physicians ( CANP ).